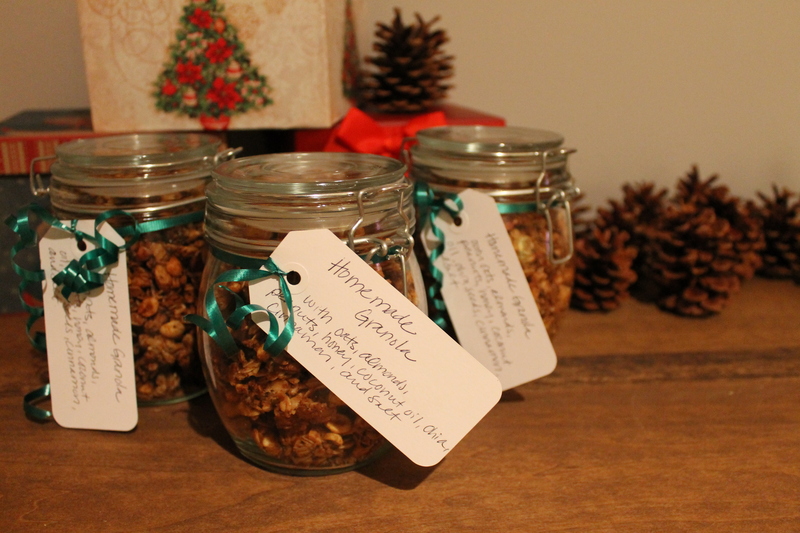 I sent out homemade granola for Christmas a few years ago. It was my first time making granola and I sent it out knowing that it wasn’t great. I don’t remember where I got the recipe, but it was fussy – toasting everything on the stove first and the constant stirring once it went into the oven. It had a lot of oil and sugar too. Not so healthy in the end. And it came out just looking like some toasted oats in a bag, no clusters to be found. I sent some to my grandmother but I never heard anything from her about it. Sometime the next year I spotted it tucked away on her bookshelf. I laughed to myself because she probably didn’t have the heart to tell me she didn’t like the look if it. I spared her and threw it out myself. After that, I gave up on granola for a little while. After reading so much about the joys of homemade granola I decided to try again this year. I started playing with ingredients and tips from around the web. My second first attempt was born out of what I had on hand and it turned out great and I’ve been playing with variations of this recipe ever since. I love this recipe because it’s simple, just toss and bake. The egg white gives you great big clusters that make it perfect for snacking. Lighter in sugars and oil than most recipes, it is not sweet on its own, but is beautifully balanced with dried fruit. It’s just great to have on hand, a house granola. Combine all ingredients except egg white in a large roasting pan or rimmed baking sheet. Mix in the egg white. Spread and press mixture across the bottom of the pan. Bake for about an hour without stirring, rotating the pan every 15 minutes or so. 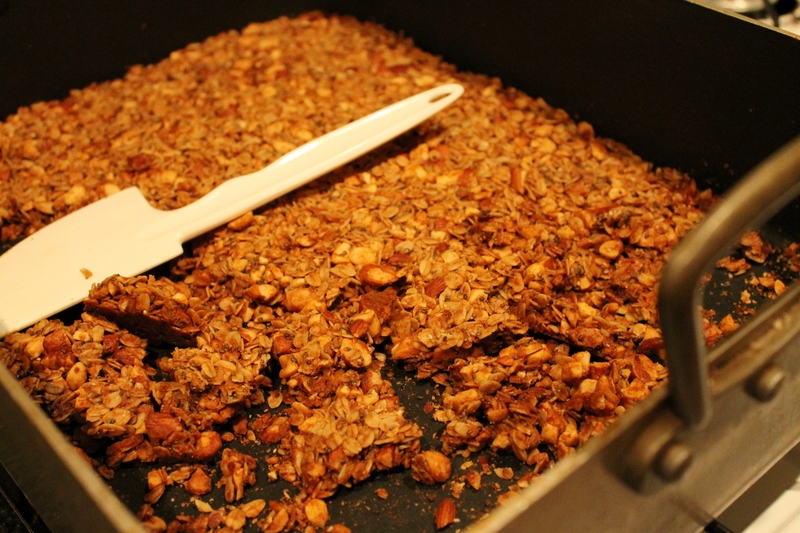 The granola is done when it is evenly golden brown. Remove from oven and let cool in the pan. The granola will darken and harden as it cools. Yummm — ! I’m going to make some this weekend. I think you’ll like it. Share your variations!